For my trip to Europe this year, I decided to book my economy class flight with Air New Zealand as they provided one of the shortest flight duration at a departure time that suited me (Friday night just after work). Given the time zone, I would arrive at London Heathrow Airport at about mid-day the following day (the joys of time zone). On booking the flight, the website stated that an online check-in was possible for my flight and I could print my own boarding pass so that I don't have to go through the check-in counters anymore. On the day of my flight, I skipped the check-in counter entirely (I was only bringing a carry-on backpack with me so I didn't need to drop any bags either), and made my way through security. The departures terminal in Auckland International Airport is quite modern and provides many amenities and shops for travelers waiting for their flight. It however doesn't compare with airports like Changi Singapre International Airport, and soon I was out of things to do, so I headed towards my gate to wait for boarding. Whilst waiting for my flight to board, I was called up to the gate counter by the airline staff as apparently, the online check-in process does not really work (translation: the online check-in was pointless) and they were unaware if I was actually in the airport or not, and had to officially check me in at the gate and print me an official ticket. The staff suggested that in the future I use the self service check-in kiosk as the online check-in doesn't actually achieve anything (Tip: don't bother with the online check-in and use the self service check-in kiosk at the check-in area of the departures terminal). The area around the boarding gate was isolated from the departure terminal and didn't have much in the way of amenities or shops that you would normally see in bigger airports. There were toilets, drinking fountains and a few power outlets in case you need to top up your electronics. The boarding process was fairly standard, however it was disappointing that the airline staff at the gate didn't seem to know Air New Zealand's products very well. As part of the priority seating that I purchased on top of my flight, my ticket allowed me to get priority boarding for my flight. However this didn't happen and I boarded the flight when my section of the plane were called up to board. 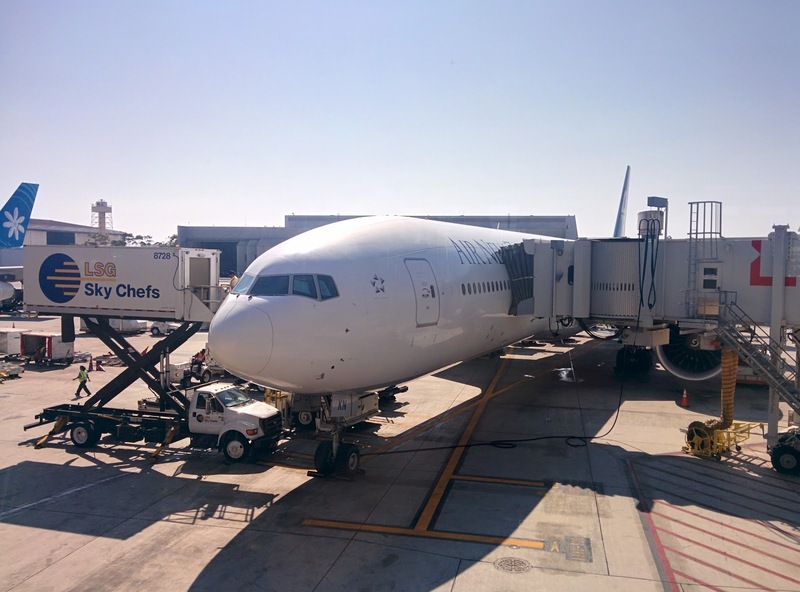 (Interestingly enough their american counterparts seemed to know more about Air New Zealand's products than the kiwis do as priority boarding was provided as an option during boarding at the transit airport at Los Angeles International Airport. The plane departed on time just before 10 pm NZ time and we were on our way to Los Angeles Airport. 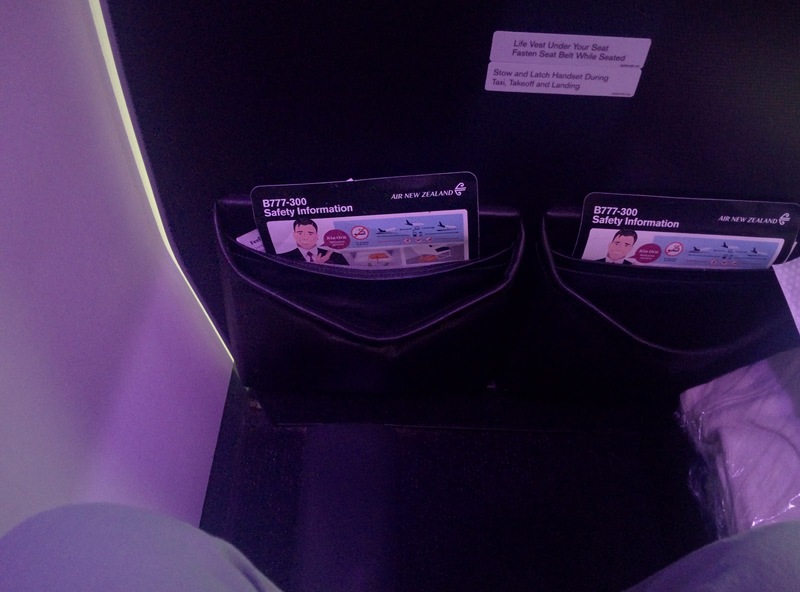 As I purchased, priority seating with my booking, I was able to sit on the exit row (48A) and get a little more leg room for the flight. As the seats in the Boeing 777-300 are configured for 3-4-3 (11 seats wide), the seat is one of the narrowest economy seats I've ever sat in (if not the narrowest). The narrow seats, means you're generally sitting shoulder to shoulder with the person next to you. Luckily I didn't have anyone sitting next to me for much of the Los Angeles to London leg of the flight. 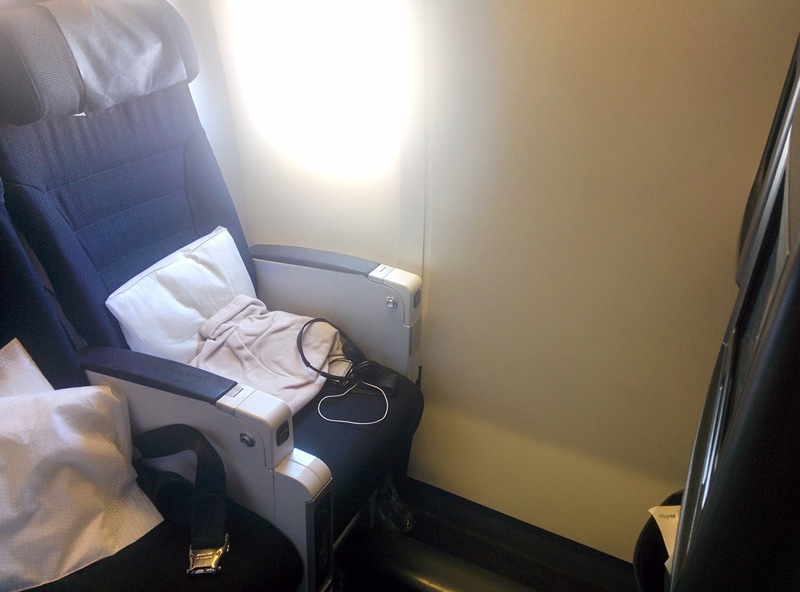 The seat was otherwise comfortable and well equipped with nice features such as a touch screen monitor, a remote control, and best of all power outlets (USB or electric plug) for your electronic devices located under the 48 A seat (otherwise available on near the screen in other seats). Another thing I really liked about the environment is the mood lighting inside the plane depending on the phase of the flight (I especially like the purple tint). On the whole, I think booking the priority seating was worth it in the end, however you will need to consider a couple of things when deciding to do so as well. The chances that you will be close to a crying baby is very high as the priority seats are also where the baby's bassinet can be attached (I couldn't sleep as the baby a few seats across me was crying for much of the Los Angeles to London leg of my flight). Although the extra legroom really helps with providing more space for your knee, you don't gain a lot of space in terms of how far you can stretch your feet due to the wall. 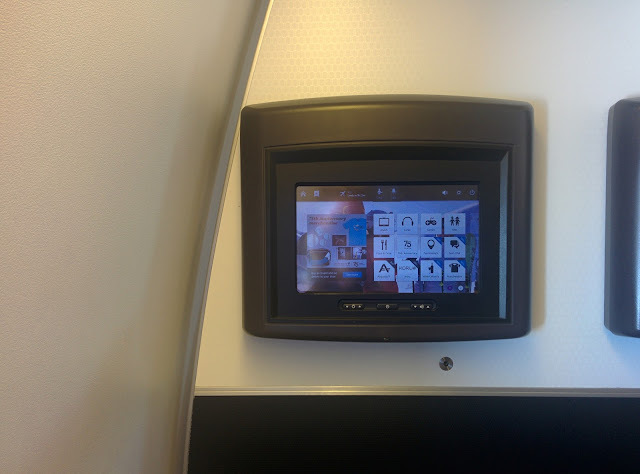 The in flight entertainment features a selection of somewhat recent movies, TV series, games and music to keep you occupied during the flight (though I have a feeling that competitors that I have flew in such as Qantas have a wider and newer selection of movies). In addition the user interface of the in flight entertainment system felt a little laggy and was at times a little frustrating to use. An innovation that I love in their in flight entertainment is the ability to order free (as well as paid I think) snacks during certain periods of the flight when you get a little hungry. I think this is an awesome innovation that makes the job of the flight attendants easier, and enhances the passenger experience. 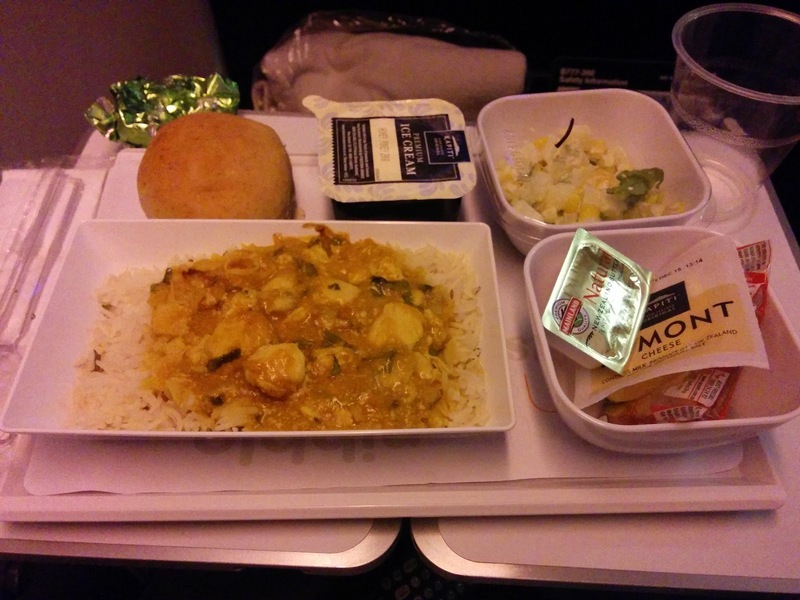 The food served during my flight were delicious and of good quality (for an airline food). I would consider the food as one of the nicer tasting in-flight meals I have eaten. Dinner (Auckland to Los Angeles Leg) - Chicken curry on basmati rice, premium kapiti hokey pokey flavoured ice cream, potato salad, cheese, bread and crackers. 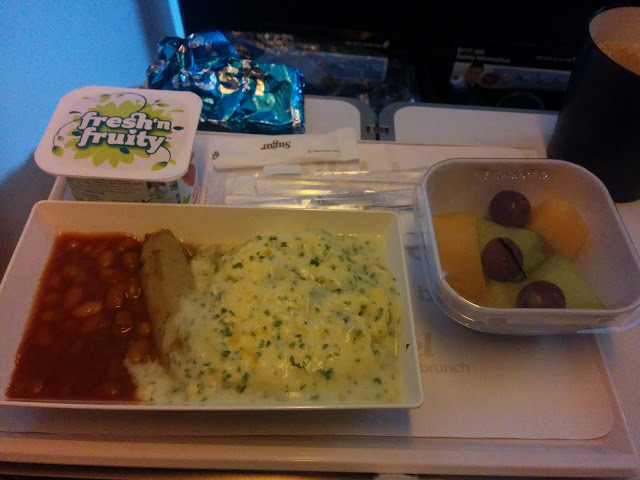 Breakfast (Auckland to Los Angeles Leg) - Scrambled eggs with sausage and baked beans, yogurt and a selection of fresh tropical fruits. 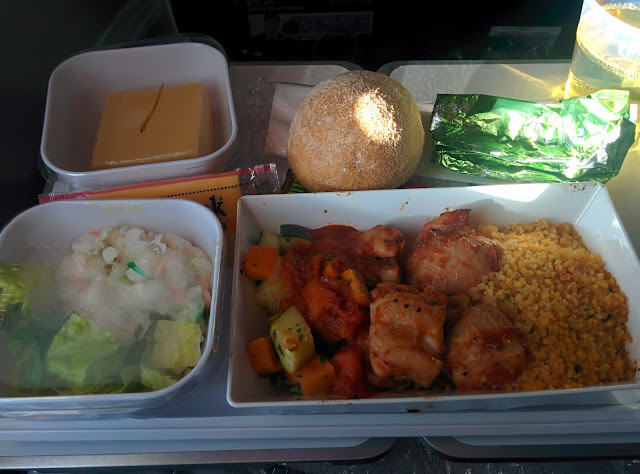 Lunch (Los Angeles to London Leg) - Chicken in tomato sauce with couscous, salad (potato and lettuce), pudding for dessert, cheese, bread and crackers. 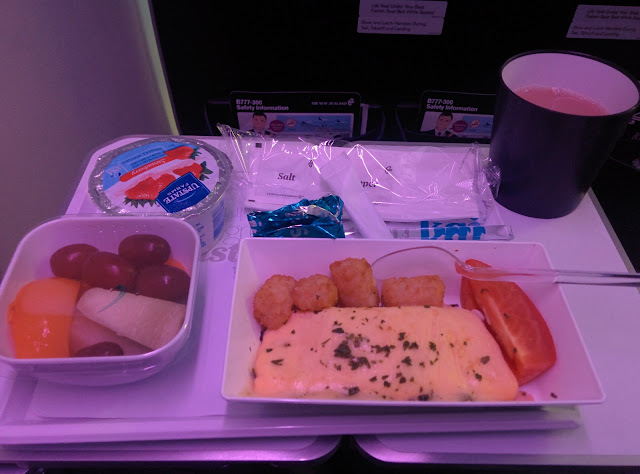 Breakfast (Los Angeles to Auckland Leg) - Omelette with tomato and potato mash bites, yogurt and a selection of fruit. Air New Zealand NZ1 Auckland to London flight transits in Los Angeles international airport to pick up some new passengers (and let out passengers wishing to go to Los Angeles). I've heard a lot of things in terms of how much of a trouble it is to transit through Los Angeles airport due to stringent security requirements especially when compared to top airports such as Singapore Changi airport. However it was nice to see Air New Zealand put special effort in minimizing the pain and inconvenience of trainsitting through the airport via it's NZ1 transit pass which gives you fast track to get you through immigration and security checkpoints as quickly as possible (along with staff helping to tell you where to go). 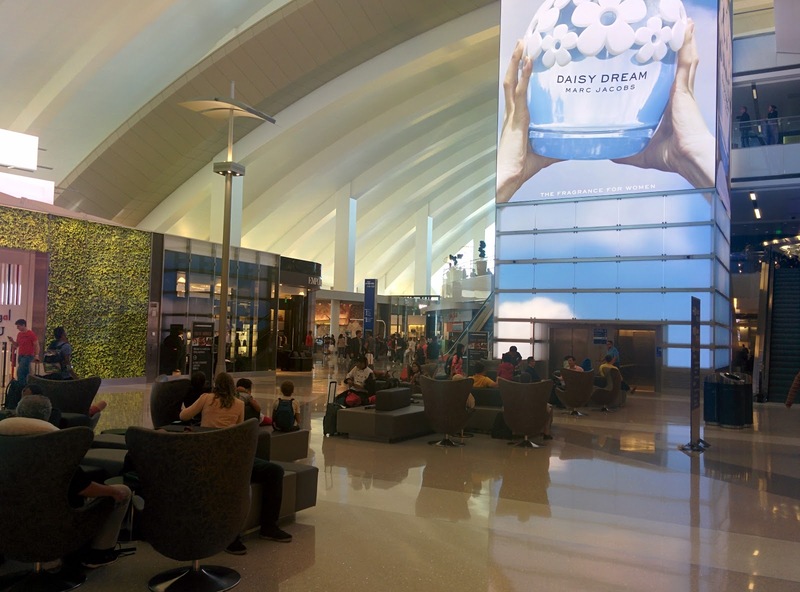 Once past the immigration and security checkpoint, passengers can then return to the terminal and enjoy the amenities and shops available at the Los Angeles airport. The Los Angeles Airport provides a better passenger experience than Auckland International Airport through more passenger amenities and a more optimized departure terminal (gates that are well integrated into the departure terminal with easy access to shops and amenities). This improved experience stretched out to the ground staff at the gate who actually bothered to handle boarding procedures properly and process passengers who paid for priority boarding accordingly. Although the flight experience at the ground level in Auckland International Airport was sub-optimal (combination of online check-in feature not working and ground staff not processing boarding accordingly based on products and services that a customer pays for) to say the least, this was more than made up for a good flight experience in the air and on transit in Los Angeles Airport. The flight arrived 30 minutes early before lunch at about 11 am which is a bonus and allowed me to get out and about in London earlier than I would have. The food and flight service on the flight was impeccable and would definitely recommend this flight to those looking at booking this flight (either from Auckland or from Los Angeles).